In November 2007 The CCCBR Public Relations Committee published a recruitment poster to complement the recruitment leaflet Bell Ringing published in 2005. The Committee gratefully acknowledges sponsorship by The Ringing World , as well as an anonymous donor, towards the cost of producing these posters and warmly thanks Roger Lawson, Richard Offen and Neil Donovan for generously providing the photographs. 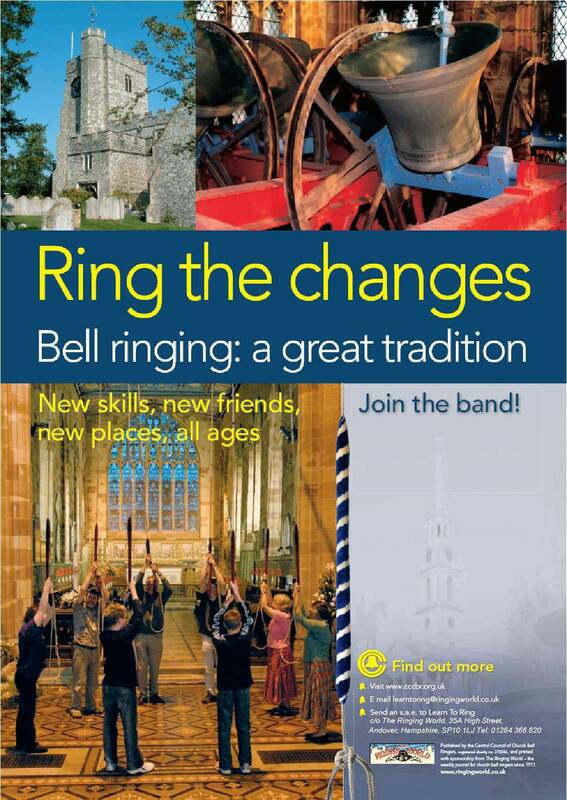 The posters aim to publicise ringing and summarise what it is about with the goal of attracting new recruits and to give links both to this website and to The Ringing World website. The intention is that the posters can be displayed where they will be seen by members of the public (eg church halls, church porch and church gate noticeboards, community noticeboards, libraries etc) and there is a space on them for inserting local ringing and contact information. Printed copies are available on request from John Harrison at (email). If your requirement is urgent, please say so when requesting leaflets. Although the posters are free, donations towards the cost of postage are welcome. JPEG image – Can be copied into an editor of your choice, and overlaid with local contact details, etc. Microsoft Word© file – Can be edited using Microsoft software. Please note: all these files use the same basic image. The larger formats don’t contain more resolution, and the image granularity will not be as good as the professionally printed poster.